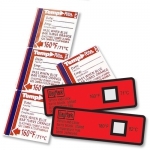 Temperature safety is of vital importance in the kitchen environment. In order to ensure food safety, proper temperatures must be reached when cooking food, chilling food, and sanitizing kitchen equipment. DayMark Safety Systems provides a complete line of temperature safety products. 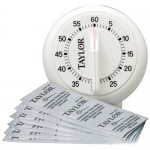 From an extensive collection of Taylor thermometers to dishwasher test strips, DayMark makes it simple for food service operators to accurately monitor kitchen temperatures.